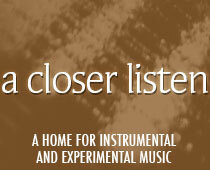 The biggest instrumental music preview on the planet returns! With nearly 250 albums already announced, we’re expanding our feature into a five-part series. We begin with the Rock and Post-Rock calendar, one that has seemed sparse in recent months but is now about to heat up. With new albums in the works from Godspeed You! Black Emperor, Mogwai and Taka (from Mono), our dance cards are finally being filled. But there’s plenty more to investigate ~ go deep into the list to discover some worthy surprises. More announcements arrive daily, so be sure to check our News page for frequent updates. We hope you will enjoy this selection of upcoming music ~ a happy autumn to all of our readers! Our cover image comes from the amazing Pamela Zagarenski, one of the best illustrators we’ve ever encountered. To see more of her fabulous artwork, visit her here. Seemingly rejuvenated following their surprise comeback in 2012, GY!BE is about to release their third album in five years. The time has never been more right for their brand of social protest, which though best experienced live is also powerful at home. Dismayed by leaders, borders, human rights violations and environmental degradation, the band channels their anger through music. The effect is bound to be cathartic. GY!BE fans will also be stoked for the upcoming album by Big | Brave. The timbres are thick and loud, while the guests include Theirry Amar and Jessica Moss. Lyrics are included, but it’s all about the rage and bombast. Consider Ardor a meaty appetizer (Southern Lord, 18 September). The Doomed Bird of Providence has gone completely instrumental on its latest opus, showcasing guest stars Angela Chan and Katie English. Burrowed Into the Soft Sky is both an indictment of colonialism in Austrailia and a requiem for innocence lost (Front & Follow, 1 September). Temporary Residence is set to release two massive albums in the next month. The first is bound to start conversation, as Mogwai ends up doing a fine imitation of Modern English on “Party in the Dark”, while offering fans what they clamor for on “Coolverine”. But there’s a lot more where these came from, including the rocking “Old Poisons” and the triumphant “Don’t Believe the Fife”. Be sure to check the single release of “Party” for the raucous non-album track “Eternal Panther”, which sounds like vintage New Order shoved through a wall of distortion. Every Country’s Sun (pictured above right) is released 1 September. Later this month, Takaakira (“Taka”) Goto releases a new collection as Behind the Shadow Drops. Harmonic features Helen Money on cello, and is bound to please MONO fans looking for this year’s fix. Breaking with the template he established on Classical Punk and Echoes Under the Beauty, Taka wears multiple masks, from post-rock to modern classical, and the emotion ebbs and flows like a river in storm season (22 September). It’s amazing how much Finland’s NYOS sounds like a band, considering the number of members (only two!). Navigation (pictured right) finds the pair in fine form, offering a set of energetic charmers guaranteed to get heads nodding (Meta Matter, 29 September). Memnon Sa offers a sort of tribal, progressive post-rock, and it doesn’t take long for Lemurian Dawn to weave its magic (Aurora Borealis, 29 September). Mixing influences of ambience, post-rock and techno, Guy Andrews creates an intriguing blend on Tåke, inspired by a series of hikes in Norway. “Fjell” first drew us to the project, while the StormLapse video for “It Cannot Surface” adds depth (Houndstooth, 22 September). Ici d’ailleurs has a pair of albums in queue, each of a different tone. Orchard‘s Serendipity is is sprawling and diverse, in the manner of Oiseaux-Tempête (15 September); it’s the eighth in the Mind Travels series, which will be extended this fall with a beautiful photo book from Francis Meslet. Chapelier Fou‘s Muance runs post-rock through an electronic filter, and has a sparkling, upbeat vibe (13 October). Check out the lead single below. Also on the positive tip we find Stafrænn Hákon (now a quartet) building post-rock pieces around an anchor of harp. The lead single is warm and inviting, and we’ll be able to hear the rest of Hausi on 18 September. Steven K. Smith (A Signal in the Static) has been part of both ambient and post-rock bands, and the two influences are blended on A Future Remembered (4 September). Combining ambience and post-rock guitar, Michael C. Sharp creates a relaxing atmosphere on Never Enough Time (Holodeck, 20 October). Nine Inch Nails’ Alessandro Cortini continues to blaze his own trail on Avanti, gluing raw, dronelike guitar sounds to nostalgic family videos (The Point of Departure Recording Company, 6 October). Space rocker Gel-Sol paints with psychedelics on Horse Head Bookends, whose die-cut, changeable cover (one panel for each piece) is pictured to the right (Verse, 19 September). Andrew Weatherall offers progressive rock dance on the crossover set Qualia (Hoga Nord, 29 September), while James Holden and the Animal Spirits kick out the progressive tribal jams on The Animal Spirits (Border Community, 3 November). Upcdownc has been making hard hitting albums for years, and I, Awake is no exception. One can see them rocking out without compromise in their new video; the buzz for the upcoming tour dates should be high (22 September). Avant jazz rockers 7C (related by C’s) may sound like they’re in a hurry to play their songs, but the frenetic pace is purposeful. As seen in the video for Approaching a City, the band is attempting to replicate the feel of a modern work day: all go from start to finish. Compartment C might make one think twice and reach for the decaf (DeAmbula, 29 September). The feral canine on the cover of Noon‘s Disquiet is an indication of the rawness within; these tracks were recorded live and bustle with improvisational energy (Trestle, 16 October). And our hardest rocking album of the season is the final testament of Loincloth, whose pummeling Psalm of the Morbid Whore is released this September on Southern Lord. In the outlier section we find Slovenia’s Širom, whose brand of post-rock folk includes an unusual selection of instruments: ribab, cünbüs, balafon, ngoma drum, mizmar, lyre, one string bass, frame drums, brač, gongoma, and mizmar. Readers who recognize all of these get extra credit; others should turn to I Can Be a Clay Snapper for a musical education (Glitterbeat/tak:til, 8 September). Rock cellist Rotten Bliss also uses an unusual array of handmade instruments, which include “wonky music boxes augmented by light from a head torch and a cello-operated cut-up poetry machine”. Reverb Worship releases The Nightwatchman Sings on 28 September. And percussionist Erland Dahlen isn’t satisfied with simple drums; the post-rock flavored Clocks includes the sounds of Mellotron and metal sheets (Hubro, 8 September). What in the world is Emptyset doing in this section? The hard-hitting electronic duo has thrown a curve ball by recording an acoustic EP. Skin is psychedelic and ritualistic, a sonic surprise to its fans that may win new converts (Thrill Jockey, 20 October). Brockmann // Bargmann also defies genres by moving between them on Licht; the preview alone features one ambient piece, one electronic and one krautrock. This is the debut album from the duo, once part of Camera (Bureau B, 20 October). Andrew Weathers Ensemble’s expansive LP Build a Mountain Where Our Bodies Fall (Full Spectrum, 19 September), continues the homespun vibe of previous releases, stitching folk and rock together in quilt-like fashion. The album is inspired by the Industry Workers of the World Little Red Songbook, and the sound is fleshed out by 17 guest musicians from both United States coasts. A folk influence is also clear on Gilroy Mere‘s The Green Line, a loving tribute to Britain’s big green bus. (Fans also know the artist as Dollboy.) The album comes with a little cardboard bus that one can put together at home, and the music is as lovely as a ride into the pleasant past (Clay Pipe Music, 15 September). Check out the nostalgic video below! Thank you so much for doing this. I look forward to every Friday when I can return to these posts to see what’s new this week. Thanks! Will plan to check out NYOS.